Posted By:Unknown | At:2:05 PM Be the first to comment! (CNN) -- Mitt Romney touted his economic and educational proposals, tailored his message to the predominantly black audience, and beat back an isolated, though seemingly uncomfortable, smattering of "boos" in an address Wednesday to the nation's oldest civil rights organization. During his speech to the National Association for the Advancement of Colored People's convention, the Republican presidential candidate stressed the need to reduce government spending: "If our goal is jobs, we have to stop spending over a trillion dollars more than we take in every year. And so, to do that, I'm going to eliminate every non-essential, expensive program I can find. That includes 'Obamacare.'" That prompted a chorus of loud boos from the audience. After a brief pause, Romney responded by referencing a survey that stated that three-fourths of the Chamber of Commerce's business members said the nation's health care law make it less likely to hire people. In another seemingly uncomfortable moment, Romney enumerated five steps to restore the imperiled economy, including expanding trade, nurturing skilled workers and restoring economic freedom. "I know the president will say he's going to do those things. But he has not. He will not. He cannot. And his last four years, in the White House, prove it definitively. If I'm president, job one for me will be creating jobs," Romney said. "I submit to you this: if you want a president who will make things better in the African-American community, you are looking at him." Both lines prompted a separate chorus of boos. But overall, the audience's displeasure was scant. During the 25-minute address, the audience was mostly polite -- giving its guest light applause at various moments. Early on, Romney saw applause as he confronted the political reality he faces with black voters. "Now with 90% of African-Americans, who typically vote for Democrats, you may wonder, or some may wonder, why a Republican would bother to campaign in the African American community and to address the NAACP," the candidate said. "One reason, of course, is that I hope to represent all Americans, of every race, creed and sexual orientation. From the poorest to the richest and everyone in between." He added, "I believe that if you understood who I truly am in my heart, and if it were possible to fully communicate what I believe is in the real, enduring best interest of African-American families, you would vote for me for president." At another point, the former Massachusetts governor drew warm responses by noting the historic nature of the President Obama's election. "If someone had told us in the 1950s or '60s that a black citizen would serve as the 44th president of the United States, we would have been proud and many would have been surprised," Romney said. "Picturing that day, we might have assumed that the American presidency would be the very last door of opportunity to be opened. Before that came to pass, every other barrier on the path to equal opportunity would surely have to come down. "Of course, it hasn't happened quite that way. Many barriers remain. Old inequities persist. In some ways, the challenges are even more complicated than before. And across America -- and even within your own ranks -- there are serious, honest debates about the way forward." Much of Romney's speech centered on his policy proposals. In one instance, the candidate touted the need for education reform, offering parents a choice to send their children to charter schools. 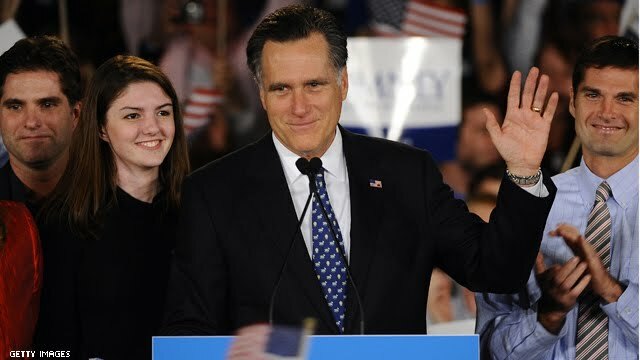 At another point, Romney defended against accusations he is running to protect the interests of the rich. The candidate also reiterated his defense of traditional marriage, earning him more applause from those in the audience. The NAACP is holding its convention in Houston. Vice President Joe Biden addresses the group on Thursday. The audience was a skeptical one, based on what it heard during the GOP primary, an NAACP official said before Romney's speech. "We've watched, in a very concerned way ... all of the Republican debates as they decided who their nominee would be," said Hilary Shelton, the NAACP's Washington bureau director and its senior vice president for policy and advocacy. "But we're concerned that the questions discussed are not specific to the African-American community. In essence, it is as much the questions that weren't asked as the answers that weren't provided." Shelton said of special concern is the unemployment rate for African-Americans, which recently rose from 13.6% to 14.4% -- just over 6 points higher than the national jobless rate. It was a rare appearance for Romney in front of a predominantly African-American audience. Only one other time recently has he done so: visiting an inner-city school in May in Philadelphia to talk about his education plans. Can infrequent appearances like these help Romney make up ground with black voters? In 2008, Obama, the first African-American presidential nominee of a major U.S. political party, captured a near-total lock on the black vote: 95%, to 4% for Sen. John McCain. This trend of African-Americans overwhelmingly voting for Democrats is not new. In 2004, Sen. John Kerry won the black vote by 77 points over President George W. Bush. In 2000, Vice President Al Gore won by 81 points. And in 1996, President Bill Clinton won the black vote by 72 points over Sen. Bob Dole. By all measures, the Obama-versus-Romney race is expected to be tight. In swing states -- especially those with large African-American populations -- the black vote could make a difference. For example, in 2008 in North Carolina, Obama won the state by just over 14,000 votes -- helped, in part, by 95% of African-Americans there voting for him. Similar scenarios played out in other battleground states with high black populations, like Florida, Ohio and Virginia. That said, Shelton of the NAACP said he feels that Romney could "surely" capture more black votes if the candidate offers economic proposals that appeal to the community. "African-Americans, like every other demographic in our country ... vote their economic interests," she said. "We want to know that the plan that you have to address the issue of unemployment in our society will also reach us; that we'll see a tailored plan that will recognize that disparity and show us how you make sure we move the entire country forward, but also eliminate that disparity in the process." He added, "Our history has shown us that when African-Americans came out of slavery, African-Americans overwhelmingly voted Republican ... because Abraham Lincoln was a Republican. Abraham Lincoln moved the policy that freed them from the bondages of slavery."